Cranberry Pistachio Biscotti are wonderfully crisp and crunchy and they are dressed for the holidays with bright red dried cranberries and lovely green pistachio nuts. These biscotti are lower in fat than most cookies as they do not contain butter which makes them a nice alternative to all the other rich baked goods during the Christmas season. 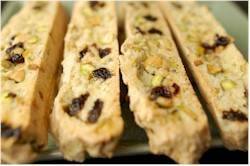 The name 'Biscotti' is used to describe a long, dry, hard, twice-baked cookie with a curved top and flat bottom designed for dunking into wine or coffee. It is derived from 'bis' meaning twice in Italian and 'cotto' meaning baked or cooked. Some biscotti do contain butter, but for these Cranberry Pistachio Biscotti beaten eggs are used to bind all the dry ingredients together. This sticky dough is first rolled (dust counter with lots of flour) into a log shape and baked until firm. After a short cooling period, the log is then cut into diagonal slices and baked again to draw out the moisture which produces a crisp, dry textured cookie that has a long shelf life. Perfect for holiday gift giving. Now, we have used dried cranberries instead of fresh in this recipe. Dried cranberries are just cranberries that have most of their moisture removed (up to 80%) through drying, either by machine or by the sun. The advantage of drying any fruit is to prolong its storage but it has the added benefit of concentrating the fruit's sweetness and flavor. The texture of the fruit becomes all soft and chewy which makes it ideal for both eating out-of-hand and in baking. Dried cranberries can be found in most grocery stores as well as health food stores. You can substitute dried cherries for the dried cranberries. Cranberry Pistachio Biscotti Recipe: Preheat oven to 350 degrees F (177 degrees C) and place the oven rack in the center of the oven. Line a baking sheet with parchment paper. Transfer the dough to a well floured counter and roll into a log shape, about 12 inches (30 cm) long and 3 1/2 inches (9 cm) wide. You may have to flour your hands to form the log as the dough is quite sticky. Place the log on the baking sheet and bake for about 25 minutes or until firm to the touch. Remove from oven and let cool on a wire rack for about 10 minutes. Reduce oven temperature to 325 degrees F (165 degrees C). Transfer the log to a cutting board and cut into about 1/2 inch (1.25 cm) slices, on the diagonal. Place the biscotti, cut side down, on the baking sheet. Bake for about 8-10 minutes, turn slices over, and bake for another 8-10 minutes or until golden brown. Remove from oven and let cool. Can be stored in an airtight container for several weeks. Makes about 20 - 24 biscotti.